The core commission of the Congress: 1. Father Gjergj Fishta 2. Mid'hat Fashëri 3. Luigj Gurakuqi 4. Gjergj Qiriazi 5. Ndre Mjedja 6. G. Cilka 7. Taqi Buda 8. Shahin Kolonja 9. Sotir Peçi 10. Bajo Topulli 11. Nyzhet Vrioni Photo by Kel Marubi. 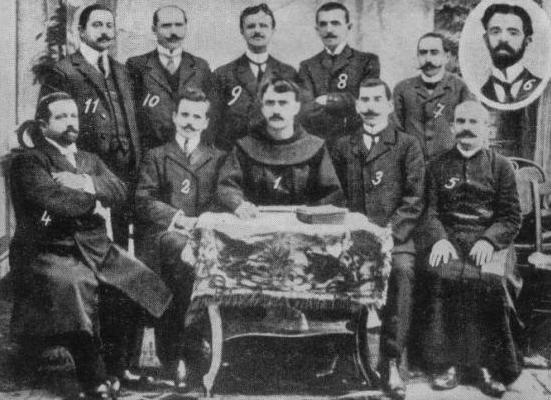 The Congress of Manastir (Albanian: Kongresi i Manastirit) was an academic conference held in the city of Manastir (Bitola) from November 14 to November 22, 1908, with the goal of standardizing the Albanian alphabet. November 22 is now a commemorative day in Albania, Kosovo, and Republic of Macedonia, as well as among the Albanian diaspora, known as Alphabet Day (Albanian: Dita e Alfabetit). Prior to the Congress, the Albanian language was represented by a combination of six distinct alphabets, plus a number of sub-variants. 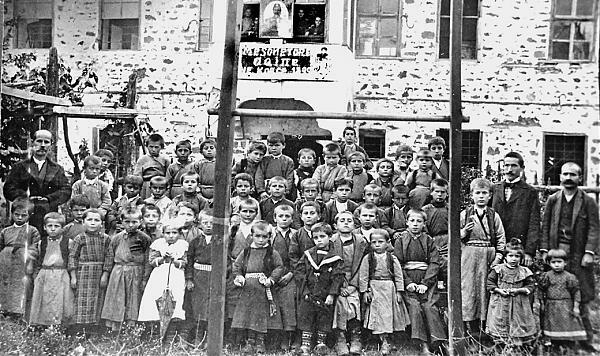 The congress was held at the house of Fehim Zavalani, which was also the place of the Union Association (Albanian language: Bashkimi) and led by Mit'hat Frashëri, chairman of the congress. The introductory speech was made by Fehim Zavalani. The participants in the Congress were prominent figures of the cultural and political life from Albanian-inhabited territories in the Balkans, as well as throughout the Albanian diaspora. There were fifty delegates, representing twenty-three Albanian-inhabited cities, towns, and cultural and patriotic associations. Thirty-two of the participants had voting rights in the congress, and eighteen were observers. At the beginning of the Congress, the delegates elected a commission consisting of eight members, which would organize the debates of the delegates and the other projects of the Congress. Gjergj Fishtawas elected chairman of the commission, while Mit'hat Frashëri became its vice-chairman. Luigj Gurakuqi became the secretary of the commission. The other five members of the commission were Bajo Topulli, Ndre Mjeda, Shahin Kolonja, Gjergj Qiriazi and Sotir Peçi. Mit'hat Frashëri was also elected chairman of the congress and Parashqevi Qiriazi chairwoman of the commission of the alphabet, which was responsible for the organization of the various alphabet proposals. The delegates decided that the Albanian alphabet and its orthography should be as phonemic as possible. Three distinct alphabets were proposed: the Stamboll alphabet, the Bashkimi (English: "Union") alphabet proposed by the Union Association, and the Agimi (English: "Dawn") alphabet. 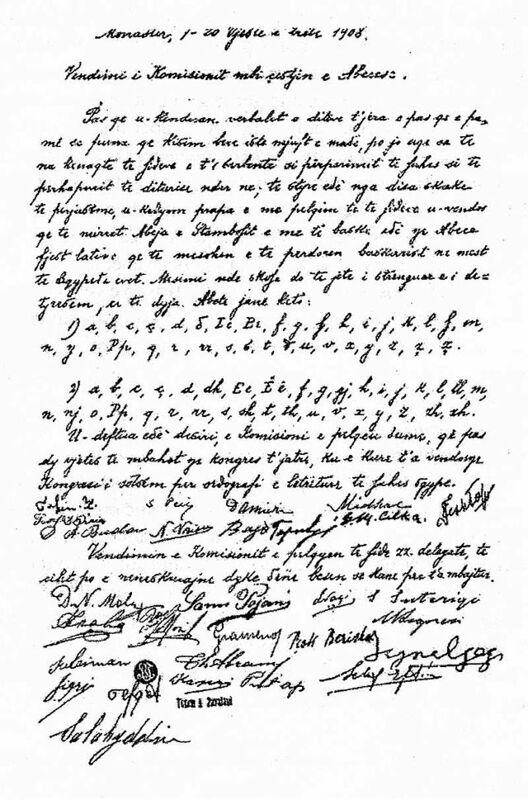 After the presentation of the three alphabets, the delegates voted unanimously for the use of the modified Bashkimi alphabet as the standard Albanian alphabet. Both the Bashkimi and the Agimi alphabet were based on the Latin alphabet; the Stamboll alphabet was based on the alphabet used officially in the Ottoman Empire and contained mostly Latin characters, supplemented by ten improvised symbols. The rector of South East European University has described it as "one of the most important dates of Albanian culture." In 2008 festivities were organized in Manastir, Tirana and Pristina to celebrate the 100th anniversary of the congress. In Albania, Kosovo and Albanian-majority areas in Macedonia in all schools the first teaching hour was dedicated to honour the Congress and give more information to the students about it. David Turnock (December 22, 1988). Eastern Europe: An Historical Geography, 1815-1945 (1 ed.). Routledge. p. 53. ISBN 978-0415012690. Retrieved 2013-09-24. Jacques, Edwin E. (1995). The Albanians: an ethnic history from prehistoric times to the present. Jefferson, North Carolina: McFarland & Company, Inc. p. 289. ISBN 0-89950-932-0. "Six successful years of SEEU". South Eastern European University. Archived from the original on 2008-05-27. Retrieved 2008-11-20. Osmani, Tomor (1999). "Historia e alfabetit" [History of the Alphabet]. Udha e shkronjave shqipe [The Pathway of the Albanian Letters] (in Albanian). pp. 461–496. Lloshi, Xhevat (2008). Rreth Alfabetit te Shqipes [About the Albanian Alphabet]. Logos.